TUMEKE! : Do we want an Australian running our news? Do we want an Australian running our news? 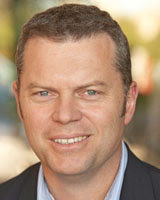 Television New Zealand has appointed an Australian to head its struggling news division. Anthony Flannery, managing editor of the Nine Network's flagship programme A Current Affair, will start as head of news and current affairs at TVNZ next month. He replaces Bill Ralston, who resigned this year as TVNZ planned a restructuring which will see 59 jobs lost in the department. Tell me it ain’t true – an Australian is running our news? What sin have I committed against my lord and saviour Jesus Christ for this hell to be wrested upon me? Why have you forsaken me Lord? Why? But first – TV presenter Naomi Robson is in hot water in Indonesia. She was arrested in the troubled province of West Papua after being caught with an illegal visa. The rumours are flying. Naomi Robson is reportedly in an Indonesian jail cell, or been deported or some other made up story. Tonight, the real story. Where she is. What she’s doing and the dirty tricks that put the safety of Naomi and four other Australians at risk. But how can you get the real story from Today Tonight or A Current Affair? Hello and welcome to Media Watch. I'm Monica Attard. It all began with this sensational and dubious tale on Nine's 60 Minutes. The last of the cannibals. Paul Raffaele: I’m going to try and find the evidence that they actually do eat people. Deep in the New Guinea jungle. Discovering a fascinating lost tribe. Their very first contact with civilisation. Read the transcript for the 60 Minutes story 'Last Cannibals'. No. Their very first contact with Australia's tabloid television. Whether the Korowai are still cannibals is also in dispute. But 60 Minutes sent A Current Affair's Ben Fordham and freelance journalist and lost tribe enthusiast Paul Raffaele into deepest darkest West Papua for an old-fashioned, cannibal freak show. Along the way they found Wawa. And then, for me, the most chilling moment of our journey. We find a little boy looking scared and confused. At six years of age, Wawa has been condemned to death. All because his mum and dad died suddenly. According to 60 Minutes, Wawa is destined for a ritual killing - and eating - because the villagers believe he's an evil witch. Ben Fordham: Wawa’s uncle has brought him here to this village to try to save him from the Kakua killers. Paul Raffaele: Oh, they’ve got their eye on him and that kid anytime in the next uh, 10 years, he’s got to be really careful. Because they could get him, then they’d kill him, then they’d eat him. But Fordham and Raffaele left poor Wawa to his fate. And 60 Minutes showed Raffaele more concerned with preserving the local culture, than saving the little boy. Paul Raffaele: Okay, we don't understand that they kill and eat each other but to them that's very important, at the very soul of their being. So my feeling, my desperate feeling, is just let them be as they are because, within 20 or 30 years, it'll be all over anyway. Cold comfort for Wawa who is due for dinner in less than ten years. But Paul Raffaele was worried, and he set about trying to convince 60 Minutes that the boy had to be rescued. He wrote to 60 Minutes executive producer John Westacott urging him to send a crew back to get him out. …I wonder if you’ve decided to do anything about WaWa. We understand Mr Raffaele suggested an entire story scenario. Take Wawa to Jayapura. Set him up in school. Buy him clothes and then, take him to an ice cream parlour where Nine can film the sad little boy smiling at last. Nine and Ben Fordham would be heroes. When Nine said no, Paul Raffaele went to their rivals - and Seven said yes. This is the email 60 Minutes executive producer John Westacott wrote to Paul Raffaele at 12:33pm on August the 7th 2006. “At the moment the simple story of a rescue of Wawa is a bit short of the huge production costs.” In other words it was too costly. The program with a budget in the many millions of dollars didn’t want to spend the money to save a child’s life. Nine certainly look heartless. But according to this email from 60 Minutes, money wasn't their only concern. They've decided a 60 Minutes-led rescue of WaWa is too fraught with difficulties - mainly the ongoing responsibility of what happens to him after taking him away from his relatives and natural environment at such a young age. Personally I think he's probably safe for the next few years til he gets to 14 or 15, then he's better able to decide himself if he wants to try to get out via Kornelius. Rescuing Wawa would be a big commitment, but there was more at stake here than a little boy's life. It's been a bad year for Today Tonight's Naomi Robson. She's endured negative profiles, claims that she consorted with unsavoury types, rumours of her make-up Winnebago at Beaconsfield, and lest we forget, that khaki shirt. 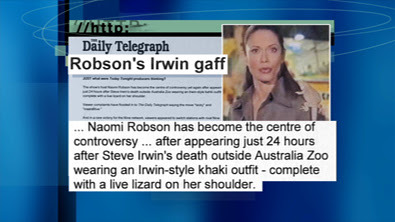 ... Naomi Robson has become the centre of controversy ... after appearing just 24 hours after Steve Irwin's death outside Australia Zoo wearing an Irwin-style khaki outfit - complete with a live lizard on her shoulder. 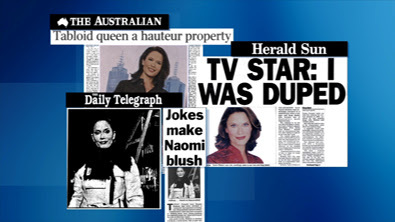 Robson has not been void of controversy throughout her career, not least with the release of two damaging blooper tapes … In one, she is caught swearing nine times in 15 seconds, calling the Today Tonight audience stupid and laughing at fat people. 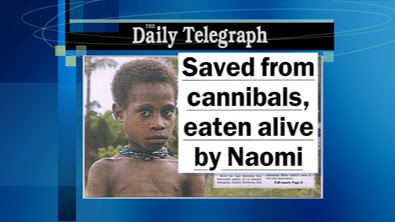 So the prospect of "rescuing Naomi" - by sending her off on a mercy mission - must have been irresistible. Only it backfired. Channel 7 crew told to leave Indonesia. Poor Naomi. She just can't put a foot right. Seven knew who to blame. Our crew flew into a set up. A dangerous, tense and extremely delicate situation. So who set us up and why? Read Peter Meakin's (director of news & public affairs at Channel 7) response to Media Watch's questions. The Indonesian Embassy says the tip off about Naomi and crew entering Indonesia on tourist visas, didn't come directly from anyone at Nine. But we can understand why Seven is suspicious. They pointed the finger at Nine's Ben Fordham. Fordham has spent the past two days spinning tall tales to anyone silly enough to listen to him. Fordham, who lives in Sydney, even made a special trip to Melbourne’s international airport at the weekend yelling out in a threatening manner to our team in the airport as they headed off to save Wawa that he knew where they were going and their flight details. Ben Fordham denies the shouting match ever happened. He says he went to Melbourne with his girlfriend and that they bumped into Naomi's crew at the airport. Ben Fordham: Let’s not beat about the bush. I can tell you that newspaper journalists have informed me in the last hour that Channel 7 people have being saying that “off the record” it was me who tipped off Indonesian authorities. That never happened and if you believe that, you believe in Alice In Wonderland. It just did not happen. Some of Seven's other claims against Fordham were even harder to believe. A $100,000 dollar bribe to an Indonesia guide? Well it's not the bribe we find incredible - it's the amount. And when we contacted Kornelius, he told us that Fordham didn't offer him any money at all. No, he has not offered me money. He didn’t tell me to do anything. He just ask me, "Am I working with the other TV? When they will arrive?" The next evening Today Tonight withdrew the claim. But they still say that Nine tried to stymie their rescue and convince Paul Raffaele to abandon Channel 7 and come and rescue Wawa with Nine. …Ben said that from this meeting the decision was that if I agreed to this, then I should name my price - whatever I wanted. But what about poor Wawa? Peter Meakin says Seven will apply for proper visas to get back into West Papua and that Wawa remains now - as before - uppermost in Seven's thoughts. 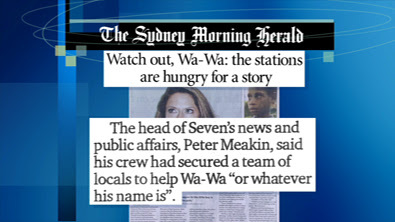 The head of Seven's news and public affairs Peter Meakin said his crew had secured a team of locals to help Wa-Wa “or whatever his name is”. Not everyone's happy about Seven attempting a rescue. ChildFund Australia has warned both networks against using Wawa in their ratings war. We would advocate the use of specialist agencies in such a scenario, with extensive experience in child protection issues, and familiarity with the communities and cultural traditions within West Papua. Read ChildFund Australia's letter to Channel 9. Using "specialist agencies" to rescue Wawa Well we doubt that Nine or Seven will be interested if there's no role for TV stars. Both networks have been shifting ground, as attention moved from Wawa, to their behaviour. On Sunday night, Nine's 60 Minutes re-ran their original story, with a new ending. But Wawa’s family and friends are determined to protect him. He’s been brought here to safety to this village a long way from the Kakua killers and our guide Kornelius has taken him under his wing. Ben Fordham: How old do the villagers wait until they would kill this boy? Kornelius Kambaren: It could be like starting from 15 years old 16 years old. Ben Fordham: So at least he’s safe for now. Well that's funny. Because back in May, 60 Minutes told us the Kakua killers could come and get Wawa at any time. Paul Raffaele: Oh, they've got their eye on him and that kid, any time in the next 10 years, he's got to be really careful, because they could get him and then they will kill him and they'll eat him. Ben Fordham: This is a pretty tough place. What are the chances that he'll survive? Paul Raffaele: I would say pretty small. But now 60 Minutes says they're doing Wawa a favour by leaving him where he is. Ben Fordham: The villagers assured us this was the best place for him. That Wawa would never be able to cope if he was suddenly taken out of the stone age and dropped into the 21st century. When he’s a bit older he can decide for himself whether to leave his people. Nine's decision to leave the boy with his family sounds responsible, but accoording to Paul Raffaele it was only last week that Nine begged him to bring the Wawa rescue to them. But Channel Nine's David Hurley and Ben Fordham say they never offered a rescue Wawa documentary. Which brings us back to our story. The central character in this story is not Naomi Robson or television crews – it’s this little boy – Wawa. That's a lie. The central characters are Seven and Nine and the story is the length that they'll go to in their ratings war. Neither gives a hoot about Wawa. What sin have I committed against my lord and saviour Jesus Christ for this hell to be wrested upon me? You are creating alternative television that is removing viewers from TVNZ and making them try desperate measures. Why the big silence over the demise of the best news in brief website we had,and no it's not stuff or the herald or even scoop matey! Xtramsn was the most concise and informative news website provided by telecom .To just let them replace it with low rent video ala tv3 is not on either,OR THE NEWSTALK FORMAT WHICH IS VERY BRIEF INDEED BLOGGY'S. Americas foreign students at university not fitting in well fiasco is a case in point of why our university should have no "business" providing scholarships (canterbury) to send our kids overseas to study on a big o.e.For god's sake can't we stick to the hundred grand plus toffs who use ex "death star" boss the hoodster at oxon? sky news australia... the leading story was (as is on almost every single other news media source) the school shooting in VT. This tonight however was replaced this wednesday evening with a story it would seem much more newsworthy... The Australian Rules Football tribunals decision about last weeks annual derby between west coast eagles and fremantle dockers in which one player thumped the crap out of another player... gotta love the footy! Imperialists interfering in other people' cultures AGAIN...you're not wanted in Iraq either.